Rights for People, Rules for Corporations – Stop ISDS! Corporations have their own global private court system – called ISDS – which they use to bully governments. But many victims of corporate human rights abuses don’t have any way of winning justice. Instead, we need a tough global system that can punish multinationals for their crimes. On January 22, 2019, our coalition launched a European petition across 16 EU Member states, to make the EU and European governments end corporate privileges! ISDS – short for ‘Investor-State-Dispute-Settlement’ is an obscure parallel justice system only accessible to the super-rich. Multinational companies have used this system to threaten governments that dare to stand up to them with claims of up to billions of euros. And they don’t always have to win a case to get their way. For many countries, the mere threat of a huge claim can be enough to persuade them to back down and let the corporate fatcats win. When millions of people across Europe rejected the EU-US trade agreement TTIP, many people learned about ISDS (which was part of the deal) and were very angry. Now there are plans to scale-up ISDS by creating a permanent global court where corporations can sue states. The EU and member state governments want to do this by inserting it into new trade agreements. Their support for such an unfair toxic system must be challenged. In order to stop ISDS we need to oppose these new deals and get rid of existing ones. Corporations and the super-rich do not need a separate system to protect their rights. Human beings need more rights, corporations do not. Want to know more about ISDS? They destroy the planet. They ruin lives. They can even get away with murder. But instead of punishment, they get more power and impunity. Over the past decades, the extent of corporate power has become overwhelming. This is why campaigners and social movements from across the world have united to push for a global system that punishes multinationals for human rights abuses. Local communities from the global south winning the right to take corporations to court in places like France, Germany and the UK. A UN Binding Treaty on multinational corporations and human rights. This will give people an international guarantee that corporations will be held to account. More national and EU-level laws like the French Duty of Vigilance legislation. This forces corporations to take responsibility for ensuring that human rights are not being violated anywhere in their global supply chains. But there is a big problem. Rich countries – like the US, and most European governments – are fighting tooth and nail to stop it. The very same governments who think that global corporations need special rights and a separate ISDS court system, don’t want to give ordinary people the right to hold multinationals to account. This is why we need to fight hard to make sure our politicians wake up. They need to recognise: Rights are for people. What corporations need are rules. Despite their huge power, there are signs that corporations could lose their battle to revive ISDS and avoid a global mechanism to end their impunity. 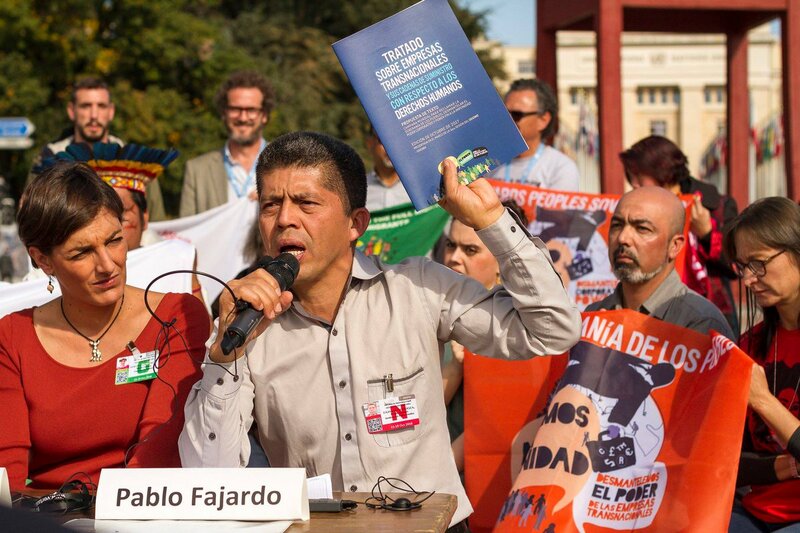 A draft of the UN Binding Treaty has been published in the face of fierce corporate opposition. ISDS has become so toxic that few politicians dare to defend it. Their new project to create a global corporate court is in its early stage, and can still be derailed. TTIP – the EU-US trade deal that would have handed unprecedented power to corporations was defeated after 3,5 million people across Europe rejected it. MEPs from across the political spectrum have begun to reject ISDS and are supporting the UN Binding Treaty. The European Parliament has passed no less than 10 resolutions in support of the UN Binding treaty. Several EU countries are working on corporate accountability laws. France paved the way with its Duty of Vigilance law in 2017. Companies with more than 5000 employees in France now have a duty to ensure that no human rights violations happen anywhere in their supply chain. If every country had this system, big companies would find it much harder to get away with serious abuses. The momentum is with us. We are living through a once in a lifetime opportunity to deal a strong blow to unaccountable corporate power. Over 500 000 people from across 28 European countries have already joined the fight to secure rights for people and rules for corporations. Sign here! Send an email to your friends and relatives, asking them to sign the petition. Share the action on Facebook and via Twitter! Get in touch with local campaigners. Check our “Alliance” page to see which organisations are supporting this campaign. Many of them have local groups that you can join. You will soon be able to sign up to our newsletter, so we will bring you updates on the campaign including exciting events and days of action. Get in touch with your elected representatives. Write to your local MEP or member of national parliament and alert them to this issue. We are a broad alliance of over 200 trade unions, campaigning organisations and grassroots movements. So far over 500 000 people have signed our petition in 28 European countries. The movement is big and it is growing bigger every day. Then please sign and share our petition. Continue reading "REGISTER YOUR EVENT HERE: Tell us what you’re doing to stop ISDS & corporate impunity"
Continue reading "Explain ISDS to your mum? Here’s why you should do it. And how"
We the people reject ISDS. So why are our governments trying to expand it? Continue reading "We the people reject ISDS. So why are our governments trying to expand it?" Continue reading "Two years since French vigilance law, momentum builds against corporate impunity"